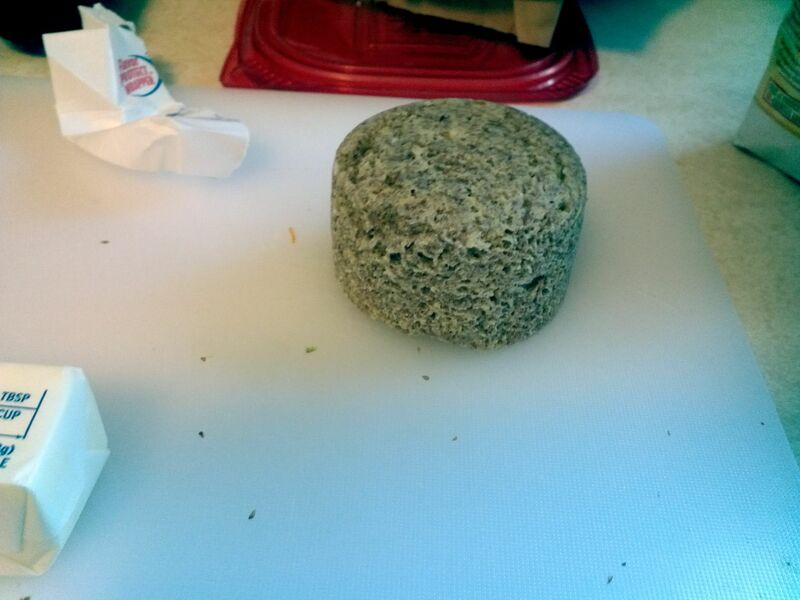 Here is the finished product in the form of a sandwich, lets see how its made. One main advantage of this recipe is its dead simple. No whipping, checking for stiff peaks, etc. Just mix the stuff in a bowl. 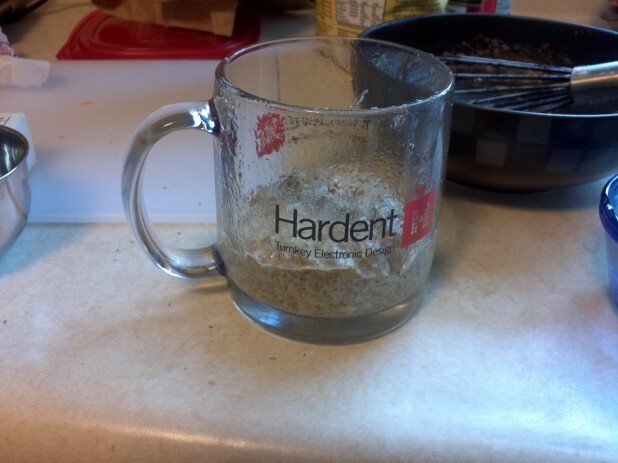 Once you’ve mixed the ingredients, just put it into a coffee mug. The next step is, you guessed it, microwave it for about a minute. I was totally shocked that it worked. It came out like a piece of bread! Here is the finished product. The only comment I would make is that it was a little unwieldy. Maybe if one had a wider coffee up. Also, it was a little high in calories and only made one. Maybe I should try and figure out a way to make many at a time … hmm. You didn’t mention how they taste! I just made this. I must say, I was shocked too that after a minute it turned into bread. It’s very delicious too. EDIT: It tastes like falafel! I am having it with labneh, beef mortadella with olives, pickled cucumber, and a home made minced beef patty (for the protein!). You say it’s a little high in calories, but I don’t see that you put the nutrition information up – maybe I missed it? Also, salted or unsalted butter? I love this recipe! I use olive oil instead of butter sometimes and it is also way better to use if you cook it in the microwave in a microwave-safe square sandwich container! It looks and acts just like bread! As for the unweildy-ness, I usually slice the muffin in to four circles then toast them in a toaster oven. It definitely improves the ‘bread-like’ quality. I imagine a classic pop up toaster would cause them to just crumble. Do you have the nutrition information?? I didn’t see it on here like you usually post. I’m mainly concerned with how many carbs are in this one. Thank you! This is the second time I’ve made this. I only used about 3/4 tsp. of baking powder because last time I could still taste that after it was done. 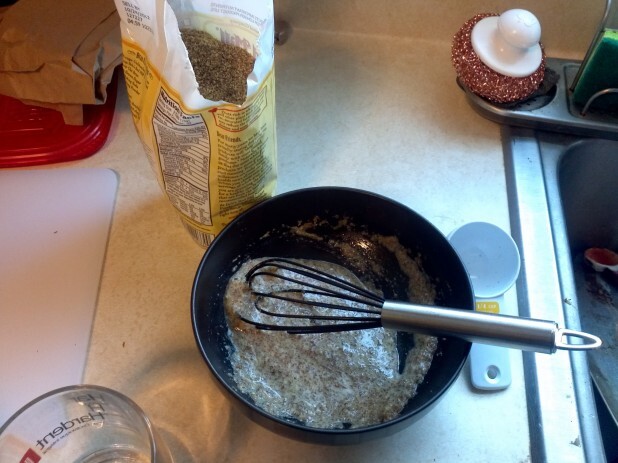 I also added a few whole flax seed to the mix, just because I like the “whole grain” mouth feel. 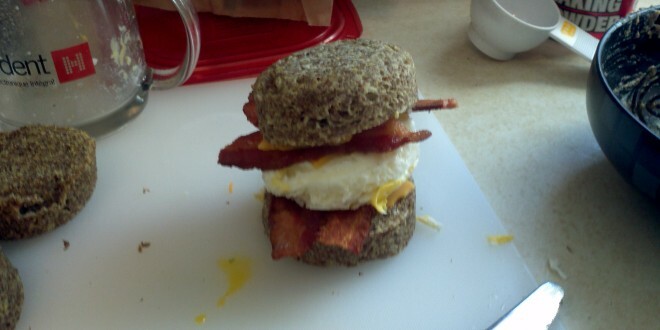 Slided it up and topped with a little bit of peanut butter, added a hard boiled egg and coffee on the side. Voila! Breakfast. If you are making an egg mcmuffin, you probably have bacon grease. Substitute the butter for grease and it works well. I prefer to use a really wide mug or a wider container so that the end product is not tall and skinny. 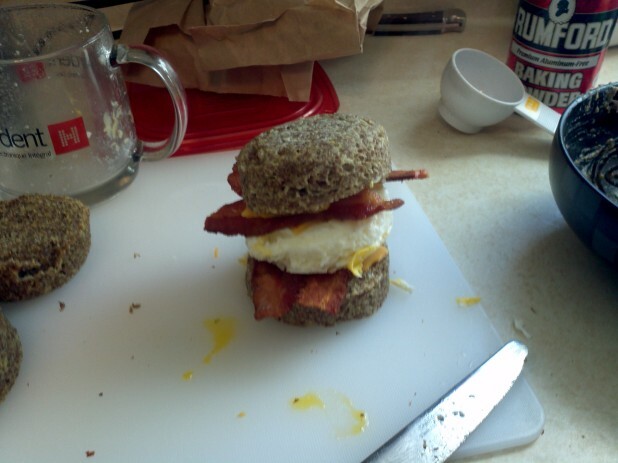 I would rather it short and fat so that it holds the contents of the breakfast sandwich. Like the comment above, if you do use a regular size mug, it will be a tall loaf, you can cut it into 3 or 4 slices, but they are pretty small in diameter. If people are looking for nutritional information, you should be using the site http://www.myfitnesspal.com, they have an app too. The site lets you build recipes from scratch and it will give you the nutritional information and allows you to track your intake. You can also save the recipes you make for later use. It also makes it easier to track things. Thanks for the Original Recipe Caveman! There’s another recipe out there you might want to try. Its a little bit more carb – 4-5 g net using psyllium husk powder and almond flour – it has the real texture of bread and taste somewhat like whole wheat. So beginner that I am I have only just discovered your blog. I tried these this week & they have been a life-saver for my craving of comfort carbs during a difficult week. I tripled the recipe in a jug & shared the mix in a 6-unit muffin pan. Baked in the oven at 180degC for 20 mins – absolutely lush! & bonus – stores well in the fridge!